This most beautiful plant has long been in cultivation. 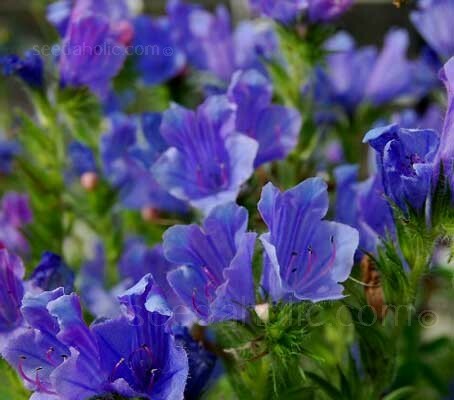 In summer Echium plantagineum bears the most beautiful dense spikes of exquisite, violet-blue flowers. Growing to only 30cm (12in) tall, the plants of Echium 'Blue Bedder', also referred to as 'Dwarf Blue Bedder' are compact and bushy. They can be planted in containers, in the conservatory or on the patio. The buds of blue-flowering echiums start off pink at first, the flowers turn the most exquisite shades of intense blue and as the flowers fade they become tinged with crimson. 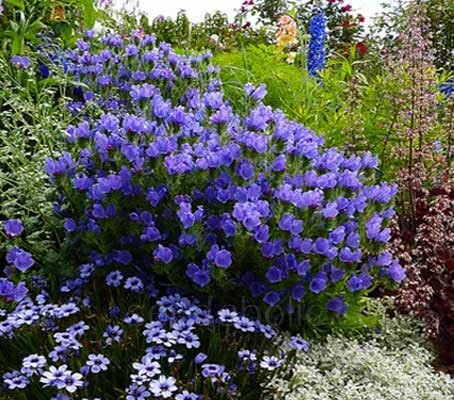 Used in the border or as part of wildlife friendly planting schemes, they are ideal for attracting butterflies and bees. 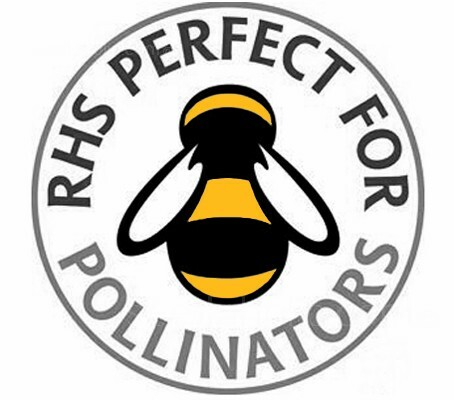 Rich in nectar and pollen, Bees are always attuned to finding the best pollen and nectar sources available. Echium is the source for a particularly fine grade of honey. It is light amber in colour and very fragrant with a pleasant floral taste, and does not crystallise for 9 to 15 months. 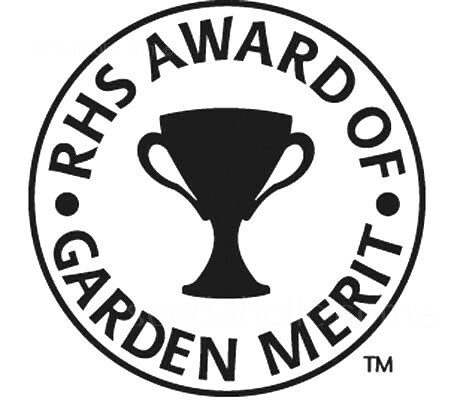 Echium plantagineum 'Dwarf Blue Bedder' has been awarded the RHS Award of Garden Merit (AGM). Echium is one of, if not THE very best plant to attract bees to your garden. Along with Borage and Phacelia, the plant is much loved by almost all bee species, especially bumblebees. Deadhead to prolong flowering and encourage new flower buds. 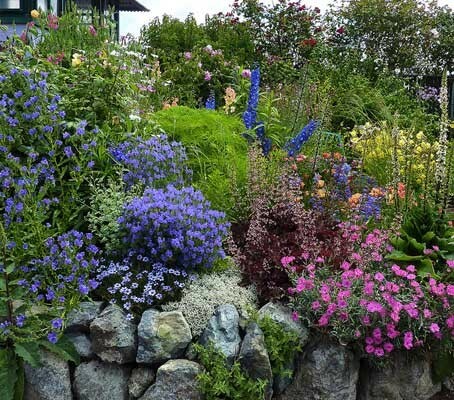 Plants will reseed themselves if a few heads are left in the garden to mature. Leave a few plants to die down to self seed or collect seed for next year, others can be pulled up and composted. Echium plantagineum is a species of Echium, native to western and southern Europe (from southern England south to Iberia and east to the Crimea), northern Africa, and south-western Asia (east to Georgia). It is a common, but not dominant, component of species-rich annual grasslands. It is also found in poor soil along the coasts of France and southwest England. Although often found near the coast but will grow at up to 800m. It is often confused with Echium vulgare, a much taller plant which has four stamens projecting past flower tube (as opposed to 2 in Echium plantagineum). Echium plantagineum is a member of the genus Echium and is commonly known as Echium Dwarf Blue Bedder. The genus Echium is named from the Greek echis meaning "a viper," it is thought to derive from the shape of the seed, which resembles a viper's head. It is commonly known as Viper’s Bugloss. Officially, the name Viper’s Bugloss is reserved for the plant Echium vulgare. In gardening circles, it is also used for this slightly divergent species. The plant belongs to the borage family, Boraginaceae.